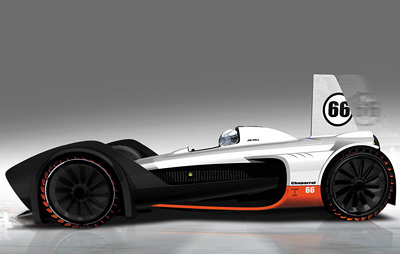 The GM Chaparral Volt was created for the 2008 LA Auto Show Design Challenge. 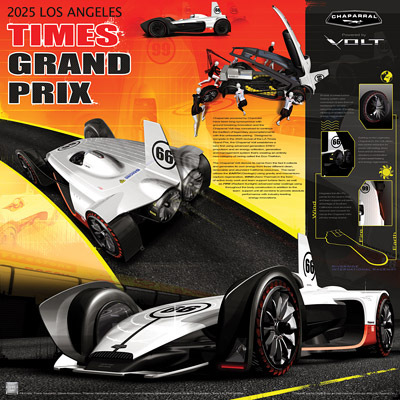 The concept was designed for the 2025 revival of the LA Times Grand Prix, the Chaparral Volt uses advanced EREV propulsion, energy collection, generation and management system to create an entirely new category of racing - the eco-triathlon. The GM Chaparral Volt collects and generates its own energy from three different clean, renewable and abundant California resources: Earth, Wind and Fire. 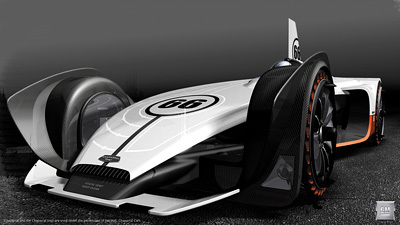 Earth (Geologic) Gravity and momentum-capture regeneration and aero-thermal resistance provide astounding levels of braking efficiency in addition to active energy regeneration. 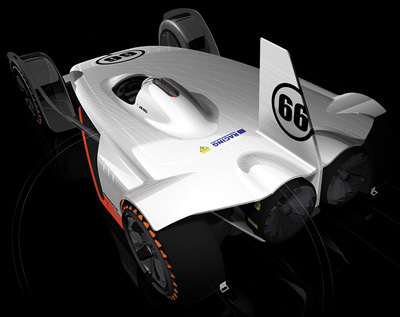 Wind (Aero-Thermal) Building on the legendary Chaparral 2J, the Volt utilizes rear turbine extractors for power cell cooling, down force and (in reversed direction) a combination of aero-assist braking and energy regeneration. 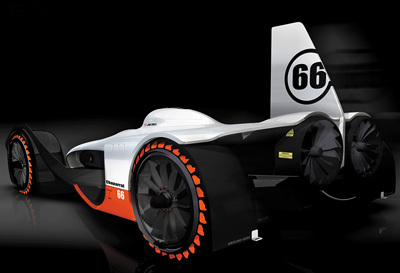 Fire (Radiant Sunlight) Integrated thin-film PV panels for the racer's body and team support unit takes advantage of Southern California's most abundant resource, the sun, and converts it for use as the Chaparral Volt's primary energy source.